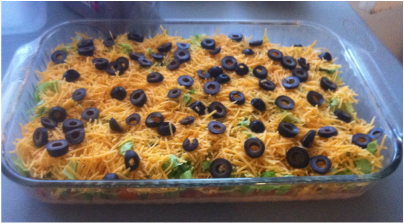 I really love Taco Dip. I've tried a few different recipes, and a combination of them makes the best dip in my opinion. I usually make this every year for a Super Bowl party and tailgating at sporting events. This can either be made in a 13x9 pan or 2 8x8 pans. This stuff is seriously addictive. I have, on more than one occasion, eaten a large portion of this dip. I'm not entirely proud of that, but it's just so good. One of my favorite appetizers to make! If you like avocados, adding some diced avocado on top right before serving is delicious! This dip is best made the day of serving. If there are leftovers, the ingredients will let out some water that will accumulate in the pan. Use a paper towel to wipe out the water, and the dip tastes great a day or two after preparation. 1. Combine cream cheese, sour cream, salsa and taco seasoning with a mixer. 2. Spread cream cheese mixture on the bottom of 13x9 or 8x8 pans. 3. Layer tomatoes and scallions, then lettuce over base. 4. Add shredded cheese, then black olives. 5. Cover and refrigerate until ready to serve.